Today's patio has evolved from a concrete slab to a beautiful design idea. 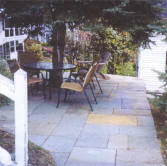 A patio can extend your living space and will last a lifetime with minimal care and maintenance. Architectural designs and materials available have no limit, and projects using natural and manufactured stone products are commonly referred to as "Hardscapes"
There are a wide variety of products to choose from to create the look you have in mind. Colors and textures can be mixed to enhance or blend with your landscaping project. 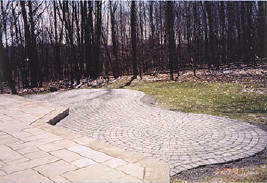 Saluppo Landscaping carries all of the products seen on this page.